My little granddaughter has just discovered money. She just got a little purse, and her mother and I searched our own purses for 50c pieces (being big enough that a toddler can't swallow them) and found seven of them for her. For days, she's been getting out her purse and asking for people to count her "monies" for her. I'm fairly sure no-one else could feel as rich with $3.50 as she does. 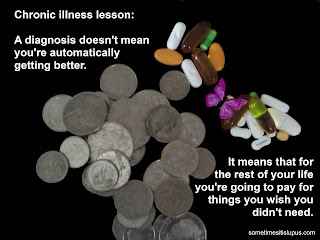 I've been thinking a bit about money these days, money and how it relates to chronic illness. 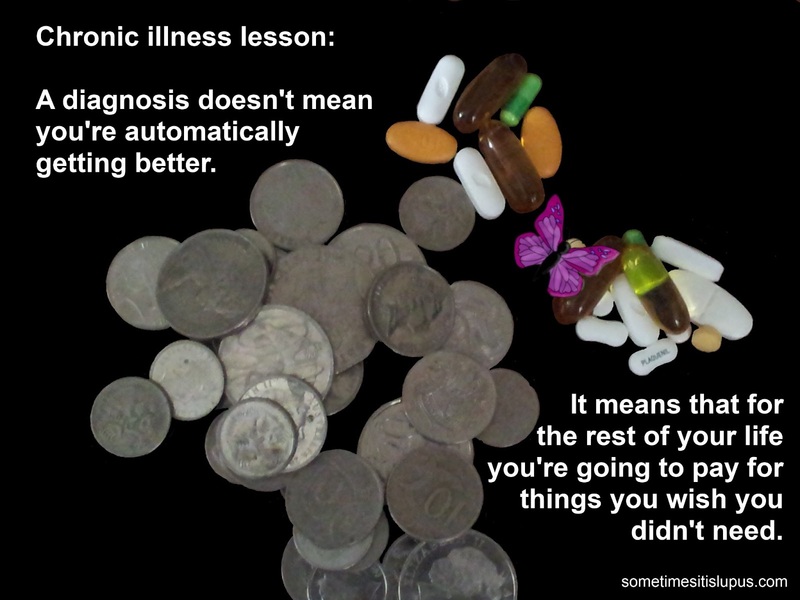 It's not just how it affects me, but others with chronic illness as well. Being sick costs money. Even here in Australia, where we have Medicare, the Pharmaceutical Benefits Scheme and Health Care Cards provided by the government as safety nets for people with lower incomes, being sick is still expensive. The more medications someone's on, the worse it is. A lot of our disposable income gets disposed into the healthcare industry. That often leaves people short in other areas. At the same time, many of us can't work, or can only work part-time, so incomes are low. Lately, I've been more and more aware of things I wish I had money for. There's a couple of modifications I'd make to my home to make things easier. But there's also lots of other things, I've noticed. You see, my network of friends, and social media friends, includes an increasing number of people with chronic illnesses. I know some people who can't afford their medications, and it breaks my heart I don't have money to help out. Someone else I know urgently needs some home repairs. Others are struggling to raise young children on their own, while coping with illness. These things aren't my problem. Not really. And none of these people have asked for my help. But now that I at last have what I actually need (if not everything I would like to have), it really bothers me how many other people still don't have that much. Money could never solve everything. What we really most need is a cure. I know that. But I still wish I could help with these obvious and important needs I see everyday. You were just desperately holding out, waiting for that news, weren't you? It's made your whole day just to know about it. Well, it really has made my day. Far too much of my life is influenced by fatigue and pain. If I have an improvement in one or the other, it's worth celebrating. I've been looking for other ways to help control pain. I have used tens machines for a while now. I have one large one that plugs into the wall, and a smaller (less powerful) battery operated one I can use while I'm out. I recently bought a heated massager that goes on the couch (I couldn't afford the actual massage chair.) That helps a little - it's certainly a little better than just a hot water bottle. Today, I tried my new foot spa for the first time. Why soaking my feet in bubbly water for an hour makes a difference, I don't know. What I do know is that my ankles stopped hurting, and were pain-free for the next two hours after the foot spa. As I write, the pain is coming back, but that's OK. I got two good hours of being able to play fetch with the dog, and do some washing and dishes, without the standing making my ankles scream in agony. Two hours pain-free (well in that joint), with only an hour of preparation to make it happen? I'll accept that as a good deal. Now, I need to work out how to get my bad shoulder into the foot spa. Do you have favourite methods for temporary pain relief? Tell me about it in the comments. friends, girlfriends, one teacher with an irrational hatred for him. And one day, at his birthday pool party, he suffers from diarrhoea, and suddenly, he's thrown into a world that is definitely not normal for a teenager. Suddenly, in addition to the normal teenager things, he has to face chronic illness, doctors (good, bad, and downright abusive), a girl with Munchausen's, changing diagnoses, fatigue, life and death. 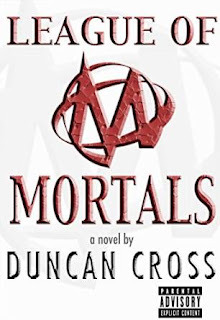 Duncan Cross draws on his own experience of life with chronic illness in this semi-biographical work of fiction (or is it a semi-fictional autobiography?) He opens up the world of Wesley Peary, a normal teenager, thrust into an abnormal world. 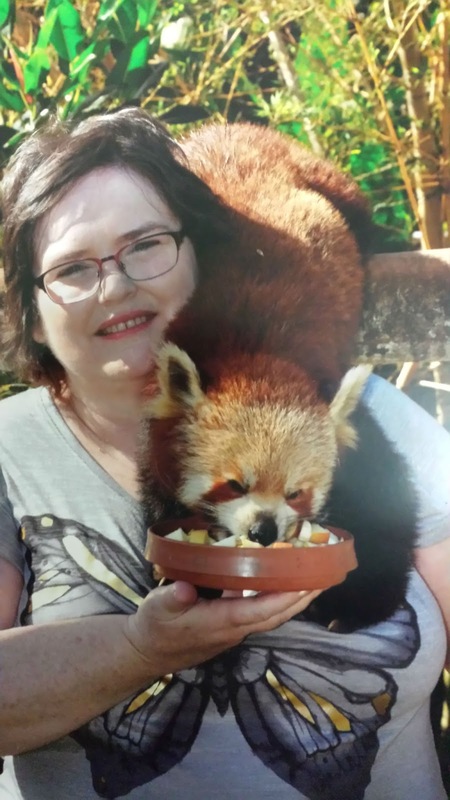 Through Wesley's story, Duncan Cross highlights major issues facing people with chronic illness: the varying competencies of doctors, the desire to do "normal" things, the cost of medical treatment and the situation of people who can't pay, the choice to end a life prematurely. It's a highly believable, highly readable story, with some pain, some humour, and a lot of poo. People with chronic illnesses will recognise parts of ourselves in Wesley. People who don't have chronic illnesses may get a window to our world through him. I loved this book. I had trouble putting it down - in the end I read it in two sessions. It would have been one, but I needed to sleep. I saw a lot of myself in Wesley, someone just trying to live their life, and being constantly interrupted by a body that just won't do what it's supposed to do. For more about Duncan Cross, visit his blog: Duncan Cross.